Editor's Note: Sam H. wrote this for his advanced pre-calculus class. In school, the infinite number of creative ways to understand problems is smothered in the small amount of time that we have to learn. This, I assume, has led to teaching the methods which have been proven to be most conventional and easiest to teach. While I think that teaching methods that are at a perfectly average difficulty is great, my interest in math has always led me to want to explore the other ways of understanding concepts. In exploring the most creative ways to understand problems, you expose the reality of forced perspective in mathematics. I use “forced perspective” to mean the average way that students’ brains tackle problems for the first time. By learning the same conventional methods for solving problems our whole lives, we develop a bias towards one method of attack over the infinite number of other ways. In exploring the many fascinating mathematical properties I could find, the Birthday Problem seemed to be the best showcase of forced perspective. It reveals our hidden bias towards logic and at the same time flaunts the beauty of creative mathematical proofs. The problem is best defined at this: How many random people must be in a room together before the chance of a shared birthday reaches 50%?. For the sake of this exploration, I want to give you the answer first. 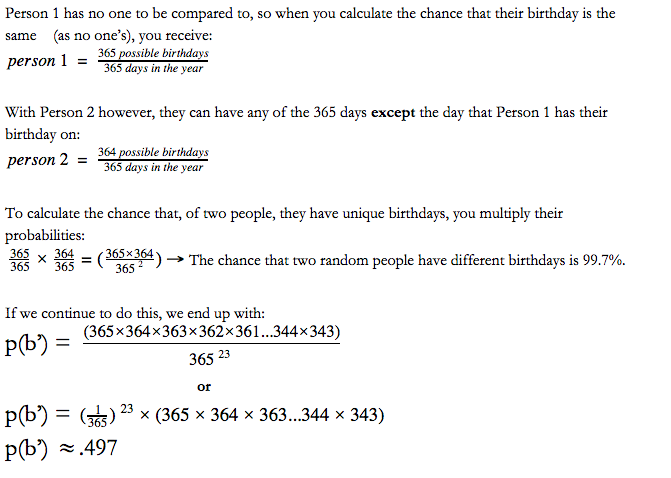 Mathematical proof shows that in a room with 23 random people, the chance that two people share the same birthday is around 50.7%. Though this answer seems to go against all conventional logic, the mathematical explanation is rock-solid. Going back to our original equation of p(b)=1-p(b’), we can now solve for p(b). By taking .497 away from 1, we are left with .503, or the approximate value of p(b). This means that, off all of the possible outcomes for shared and nonshared birthdays, there is around a fifty percent chance that two people in a group of 23 will have the same birthday. This is crazy! The math seems to make sense, but it just doesn’t seem logical. I need to see more evidence, and I have designed a method to do so that does not require constant unique groups of 23 people. I am using a website that produces a given number of random calendar days within a given time period. 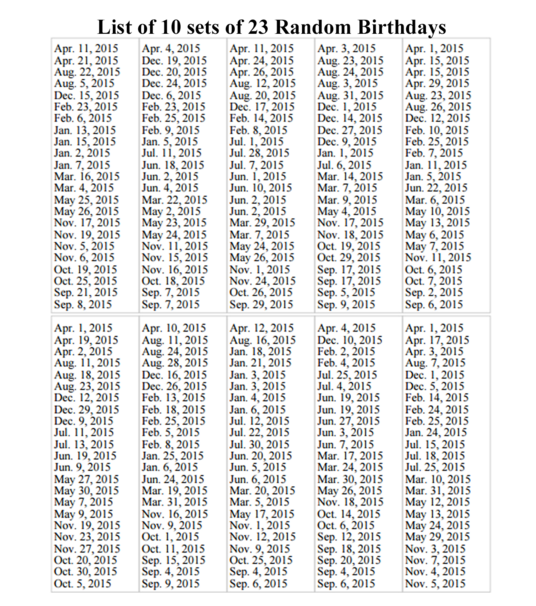 I have generated a set of 23 random birthdays in the 2015 calendar year 10 times, and the results are reproduced below. 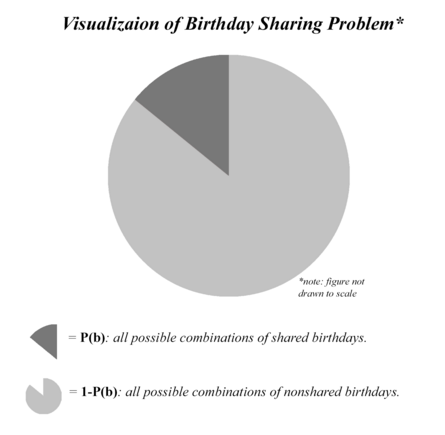 This gives us 6 birthday duplicates out of 10 possible groups, which is a 60% chance of a shared birthday. It appears as though the math was irrefutably correct. Even though there are 365 days in the calendar year, as few as 23 people can tip the scales of chance. I really liked exploring this interesting and curious problem. When I was generating the birthdays, duplicates began to seem very common and it took me by surprise. I think that math like this always seems to remind me of the power of having a unique perspective, in or outside of the mathematical world.